CLASSIC First, join a Guided Visit of the mausoleum and the humble cottage from which “Uncle Ho” ruled Vietnam until his death in 1969. Next, see iconic sites, including One Pillar Pagoda, the Presidential Palace, and the infamous “Hanoi Hilton.” Lastly, visit the 900-year-old Temple of Literature, Hanoi’s first university. CLASSIC After lunch, enjoy an Electric Cart Ride through the fascinating Old Quarter—with its 36 ancient streets where peddlers trade as they have for centuries. ACTIVE Take a Kayak Ride to visit Cua Van Village. ACTIVE Explore Luon Cave and Dark & Bright Cave by Kayak Ride. Continue your journey into Vietnam and stroll through a local market—a unique opportunity to see locals buying and selling fresh produce. Via sampan, visit the home of a local family for a cotton-weaving demonstration and a local workshop which makes rice wine and traditional candies. In bustling Ho Chi Minh City, try your hand in the kitchen with a Vietnamese cooking class and go on an excursion to the Cu Chi Tunnels—the extraordinary network of tunnels used by the Viet Cong during the war. Fly to Hanoi and explore the famous sites, such as the Old Quarter, where peddlers have traded goods for centuries on its 36 ancient streets. Next, a remarkable 2-night cruise along Ha Long Bay will show you its beautiful Limestone Islands. You’ll visit the Cua Van Floating Village, spectacular caves, and even go for a swim at Titop Island. The perfect ending to an unforgettable Southeast Asia river cruise vacation! Participation in this vacation requires requires purchase of the following flights from Avalon Waterways, not included in pricing: (1) roundtrip air from your U.S. gateway and intra-vacation air segments; or (2) intra-vacation air segments only, starting at $364. 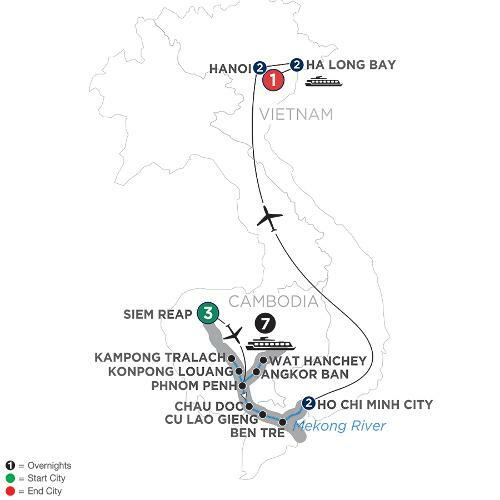 Required intra-vacation air segments: Siem Reap/Phnom Penh; Ho Chi Minh City/Hanoi. Air prices were effective on February 7, 2018 and their availability is limited. At the time you purchase your tour, air prices may be higher. All prices are per person based on double room occupancy. Cruise price based on Category B in an Panorama Suite on Mekong Deck. To upgrade to a Category A on Tonle Deck, add $400 per person or $800 in single occupancy.